Supporters of the 20th Street Park project posed for a photo on Sun. May 1. CHELSEA — They want the city's trash to be their treasure. 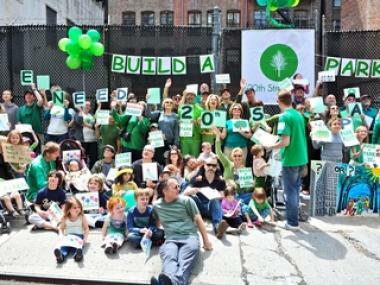 Chelsea parents who have spent years pushing for a new park at an unused Department of Sanitation lot on West 20th Street are planning a day of protest in which they'll create a pop-up greenspace there despite ongoing city opposition. The advocacy group Friends of 20th Street Park plans to gather hundreds of seniors, parents and kids Sunday to create a so-called "pop-up park" at the 10,000 square-foot lot at 136 W. 20th St. The group has encouraged neighbors to wear green — to represent green space — and use the area as they would a park by playing catch, reading a book or relaxing on a bench in front of the gated-off lot. "People can come to do what they would do if 20th Street Park was a reality," said Matt Weiss, head of Friends of 20th Street Park. The protest marks the first time the group has actively encouraged the public to use the area around the lot as if it were already a park — though it has held a series of rallies in the past that have drawn hundreds of supporters. "This time around, we wanted to build around the fact that people already use the park in all these areas already," Weiss added. Proponents of the park have long decried the city's Department of Housing Preservation Development's plans to construct an affordable housing building on the lot, saying it would be better used as green space. The HPD rejected 26 alternative sites for their building project that were suggested by the Friends in October. Neighbors supporting the park have long argued that the increasingly residential area of eastern Chelsea needs green space. Chelsea and Hell's Kitchen — the area covered by Community District 4 — has long ranked last in Manhattan for park access. Many parents are forced to make the trek either to the High Line or Union Square Park in order to get to playgrounds and green space. Organizers said this Sunday's rally and play-in will serve as a reminder of the need for a park in the area, particularly to City Council Speaker Christine Quinn. "We are working with elected officials, but it’s politics and the pace of this is not to our supporters' liking," Weiss said. Weiss added that Quinn's office pulled out of a meeting with his organization in April with no explanation. Zoe Tobin, a spokeswoman for Quinn's office, could not immediately confirm whether that meeting had been scheduled, but did say that Quinn is still paying attention to the group's plight. "We have done a tremendous amount of work with the advocates to try and find a workable solution to this issue," said Tobin. "We will continue to work with the agencies and advocates involved."